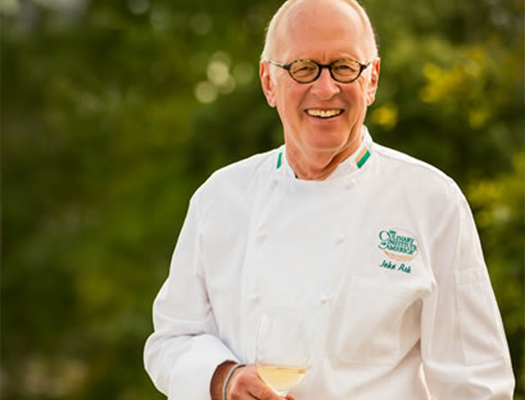 Many refer to Chef John Ash as the “Father of Wine Country Cuisine”. In 1980 he opened first restaurant in Northern California wine country to focus on local, seasonal ingredients in the quest to create dishes that complemented the wines being made in the region. John has co-hosted a radio show for more than 26 years on KSRO (1350 AM) in Northern California. He was also host of two TV shows on the Food Network. John travels the world teaching cooking classes to both home cooks, as well as, professionals. He is an adjunct instructor at the Culinary Institute of America at Greystone in the Napa Valley. In 2008, John was voted “Cooking School Teacher of the Year” by the International Association of Culinary Professionals. His passion for teaching is matched only by his passionate voice on sustainable food issues, having served on the Board of the Chef’s Collaborative, a national organization of chef’s committed to sustainable and ethical food issues. He has also served on the Board of Advisors of Seafood Watch, an educational initiative for sustainable seafood by the Monterey Bay Aquarium. John has written three books: John Ash Cooking One-on-One: Private Lessons in Simple Contemporary Food from a Master Teacher was published in 2004 by Clarkson Potter and won a 2005 James Beard award. He has authored two other books: From the Earth to the Table: John Ash’s Wine Country Cuisine and American Game Cooking. The former was awarded the IACP awards for Best American Cookbook and the Julia Child Cookbook of the Year. Chronicle Books released a completely revised and updated version of From the Earth to the Table in 2007. He is an occasional contributor to culinary magazines such as Fine Cooking and Eating Well. His new book Culinary Birds has been published by Running Press Books and is now available for purchase. John has consulted for Del Monte Foods, University of Massachusetts at Amherst, Brown-Forman Corporation, Alaska Seafood Marketing Institute, Viking River Cruises, and more.